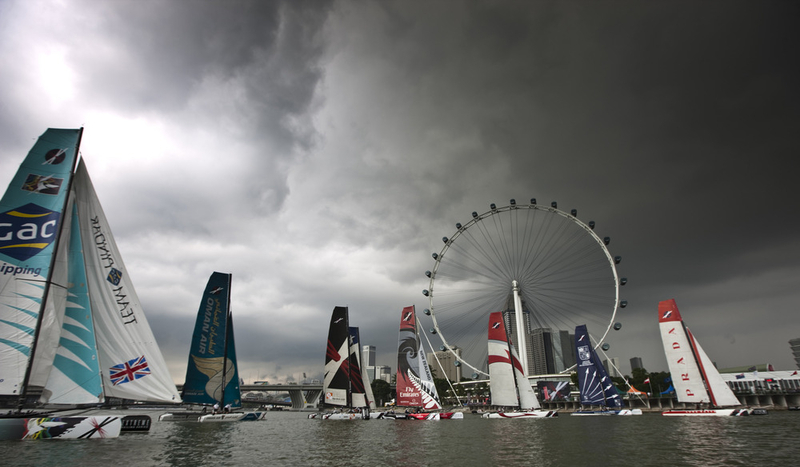 The final showdown of the 2011 Extreme Sailing Series™ has begun in Singapore under the gaze of the iconic Singapore Flyer, the world’s largest observation wheel, and the towering downtown city skyline. 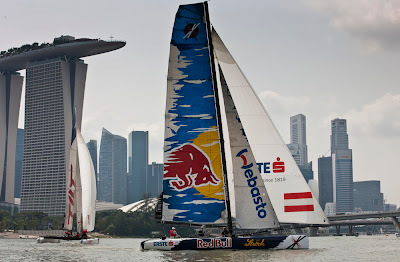 The Extreme Sailing Series Race Village nestles on the edge of the Formula 1 racetrack that has a permanent residence here in this impressively efficient city, and the 10 Extreme 40s were raring to go. The fleet includes the return of the Swiss Team TILT, headed up by Alex Schneiter, and a new team skippered by match racing supremo Sébastien Col on Team Extreme – the first club™ who faced the tougher and more experienced teams on the water today, all eager to commence battle on the opening day of Act 9 on Marina Bay. 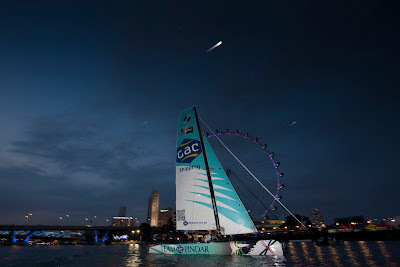 Apart from the fierce thunderstorm, the breeze was pretty good although the shifts made the game a little bit harder with some teams suffering more than others: “We’ve had a pretty tough day, we didn’t really read it too well,” said Emirates Team New Zealand skipper Dean Barker. 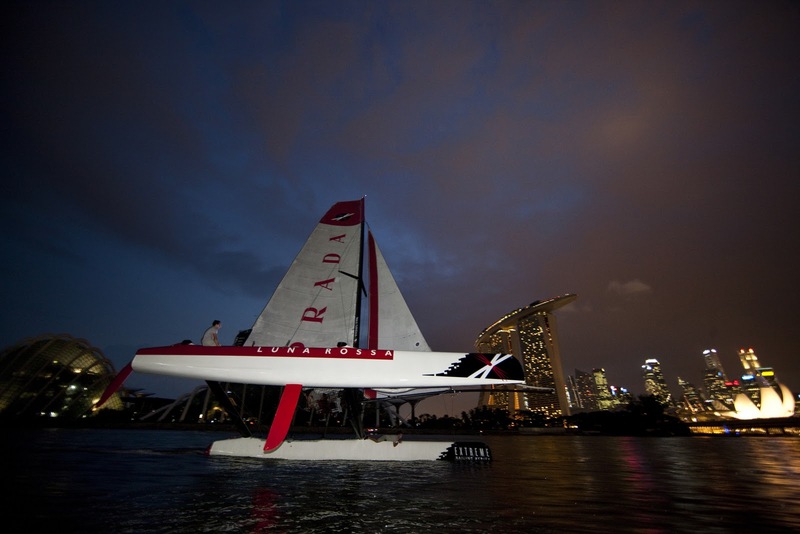 “Every time we ended up on the start line it seemed to be in the wrong place and you determine the first beat on the start, and we didn’t read it as well as some of the other guys did today.” The crew haven’t raced together since Act 2 in Qingdao, China and Barker himself last competed at Act 7 in Nice and the competition has only got tougher in his absence: “It’s very tight courses and some very competitive boats,” said Barker.“There is no question as the season has gone on that every time I come back the fleet seems to have got better, so it’s really challenging.” The Kiwi team is lying in 4th place at the end of today, ahead of Oman Air skippered Chris Draper who takes the helm for the Singapore event, a highly skilled Extreme 40 helm who also skippered Oman Sail’s Masirah to victory in 2009. Tomorrow will see racing start at the usual time of 0600 GMT (1400 local time) with media guests on board as 5th men, ahead of the event opening to the general public on Friday through to Sunday.